Covering the backyard playground with high quality mulch is a great way to provide safe play area to your kids. 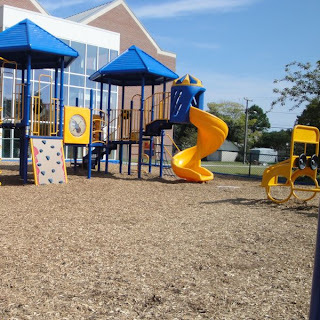 There are different types of playground surfacing options like rubber mulch, pea gravel, sand, rubber mats, etc. One such mulch is Engineered Wood Fiber, which is rated as the most common and economical playground surface. It is created from non-toxic, engineered, crushed wood fiber, like hardwoods or softwoods. The Wood Fiber mulch consists of randomly sized wood fibers with the average size of 1.5"-3" in length and contains 10%-20% of fine pieces to help in compaction. Once the mulch is properly settled, it creates a knitted & compacted layer on the surface of the playground. This initial cost of this playground mulch is comparatively lower than any other surfacing option. Moreover, it does not utilize any wood containing paint, chemicals or additives. This mulch has less or no bark and is tested to be free of leaf debris, twigs and other organic materials. It not only prevents injury due to falls but also provides a natural look to the playground. Ensure that the Engineered Wood Fiber mulch you are opting for is compliant to American Society for Testing and Materials (ASTM) F1951 and F1292-99 (impact attenuation). It should also meet American with Disabilities Act (ADA) as well as Consumer Product Safety Commission (CPSC) playground surfacing standards and has to be International Playground Equipment Manufacturers Association (IPEMA) Certified.